Put some extra fun in your weekly workout by challenging yourself to a 7 day modified heptathlon. 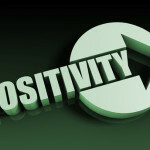 Take one event a day to keep boredom at bay, exercise different muscles and stay fit in a new way. Here are some ideas to get started tomorrow. Head to your local high school or college track for day one of your fitness challenge. On the track 10 hurdles about 2.75 feet tall are placed along 100 meters. Maybe you were a champion at this event in high school and getting back in the game is just a matter of practice. If so – go for it! 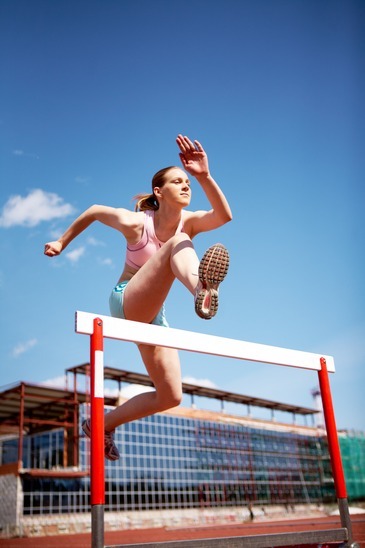 An alternative for beginners is to set up a hurdle you can comfortably clear (such as a plyobox) in your yard or at a local park. Get a running start, clear the hurdle, run ten meters then turn back and repeat until you have cleared the hurdle ten times. This track and field event takes a good deal of planning and training to complete safely. 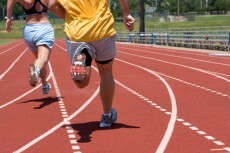 Prepare by doing sprints and plyobox exercises to build explosive strength. For day two of your fitness challenge run, sprint and do some burpee box jumps. To do a burpee box jump squat behind the box with hands hip width apart on the floor in front of your feet. Push back into plank position. Jump back into squatting position and then jump up onto the box. Jump down and repeat 10 times. On day three you get to throw a small heavy ball as far as you can. This is a terrific stress buster that also builds your upper body including arms and core. You will also burn quite a few calories. Mark Harsha, Portage High School Girls Coach, offers the following tips. Hold the shot with the fingers using the thumb for support rather than allowing it to rest in the palms. The hand should be bent back as if holding a pizza. Next, raise the shot overhead and lower until it is just beneath your jaw. Push the shot into your neck and keep your elbow parallel to the ground with palm facing the direction you will be throwing. Keeping your elbow high and eyes to the sky push the shot away from your neck. Flip your wrist as you throw. The goal is to throw as far as you can. 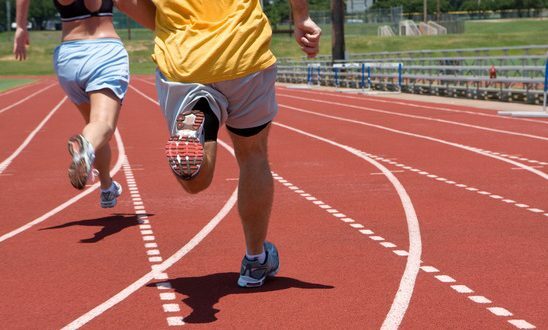 This is a great way to build speed and endurance. If you live near a track that is the best place to tackle day four of your homemade heptathlon; if not, don’t fret. Just mark the distance at a local park or even on your street and give it your all. Try foam rolling for your after workout recovery. The long jump challenges you to cover as much distance as possible in a single leap. Maybe you can’t bound over tall buildings, but you can certainly sail over a small stream. Today head out to a state park and try to jump over small bodies of water or fallen trees. Alternatively, you can place a board or even a towel on the ground in your back yard and try to jump over without touching it. On day six the javelin throw has you throwing a spear like object as far as you can. Get a running start and throw as far as it will go. You may not have a spear but you can mimic the mechanics and get the benefits by throwing a long stick. Javelin throwing can help you build your upper body, improve flexibility and range of motion. Be sure to warm up before you throw. To avoid injury don’t start out pushing too hard. 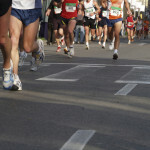 This event helps you build aerobic endurance and sprint speed. Again, a track is a great place to go the distance but don’t use that as an excuse not to run. Instead mark the distance anywhere and hit the road. Who says you have to sign up for the fire run or mud dash to keep your workout challenging? Why not try a modified heptathlon instead? Just reorder the days as you need to. If the goal is to get in some new ways of being fit and having fun with exercise, this plan just might be the ticket.